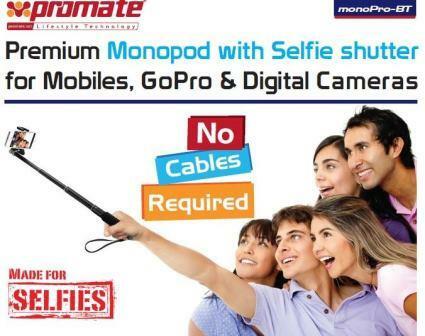 Promate monoPro-BT Premium Monopod with Selfie shutter for Mobiles, GoPro & Digital Cameras.-With monoPro-BT, take great selfies with your smartphones, cameras and GoPro. Take amazing selfies on just one click with the selfie shutter and click picture without even setting the self-timer in your device. monoPro-BT will prove to be your best companion whilst you make memories of a lifetime. So just go ahead and take those perfect shots with monoPro-BT. •Universal to fit Mobiles, GoPro and Digital Cameras. •Wrist strap for added portability. •No cables required for camera shutter control. •Shutter compatible with all smartphones, GoPro and digital cameras. Promate monoPro-Uni- Premium Wireless Selfie Kit for All Tablets, Smartphones, GoPro and Digital Camera-This unique product is a combination of three of the best featured products; a selfie stick, wireless camera shutter control and an external adjustable holder. Click selfies at your convenience with this amazing product. Now, forget about all those painstaking experiences of taking your own portraits or pleading others to click a portrait of yours. Take amazing and breathtaking shots, be it on the tallest tower or by the pool. Make monoPro-uni your best travel companion and share your fascinating journey while you experience one. • 100cm extendable arm constructed to take selfies. • Universal to fit Mobiles, GoPro and Digital Cameras. • Wrist strap for added portability. • Wireless Camera Shutter Controller. • No cables required for camera shutter control. • Shutter compatible with all smartphones, GoPro and digital cameras. Promate Zap Wireless Camera Remote Control for iOS® & Android Devices-Taking selfies is now a breeze with Zap, a handy Bluetooth® camera shutter controller. Just fix your phone on a tripod or monopod and use Zap to instantly and easily capture photos with a click. Easy to use and requires no cables. Go ahead take a Click with Zap. Bluetooth® enabled Android™ and iOS® devices. 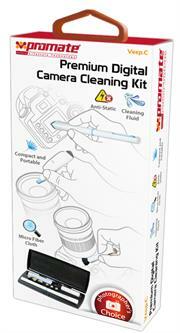 The Promate Veep.C is a complete cleaning solution kit for every digital camera to keep to its optimum performance. It has a 3-in-1 cleaning pen with collapsible design which shows off its anti-static brush for dusty parts and its triangular and circular pads to clean all places and edges of the camera. 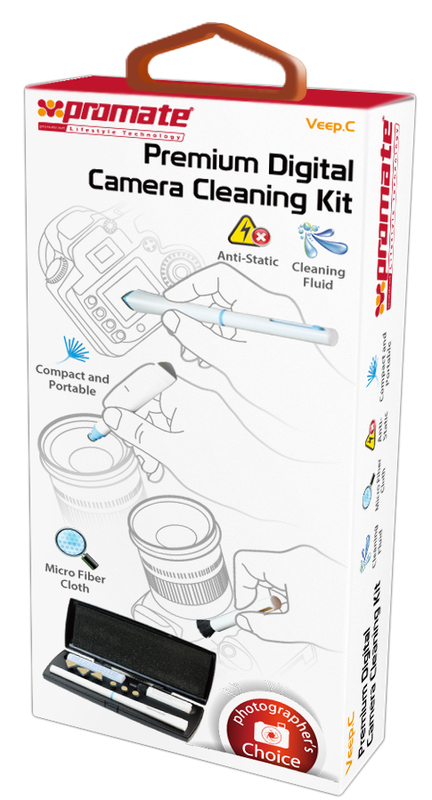 A non-residual cleaning fluid to damp on specific parts which requires cleaning and its microfibre cleaning cloth for a complete wipe for a thorough dust and dirt-free camera. A compact and portable hard case is also provided to store and organize all the cleaning tools of the Veep.C.